Supernatural season 8 continues this week with "Bitten," a unique story which echoes the found-footage tale of Chronicle to present a monster origin story, including all of the pain that comes with it. But could this Winchester-lite episode have come too soon for audiences to fully appreciate it? Like many of the episodes this season, "Bitten" essentially reveals all that audiences want to know. In shaky-cam fashion, the tables are once again turned on Sam and Dean as they attempt to investigate a new case with an ever growing body count. 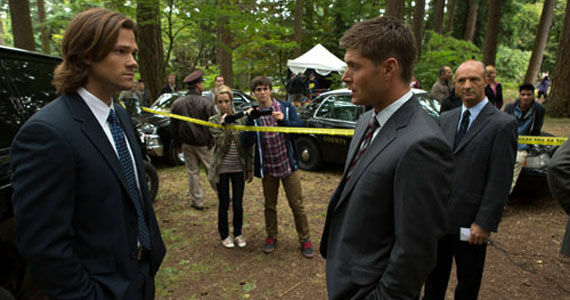 Instead of focusing on the Winchesters' storyline for this episode, audiences follow the mysterious events through the eyes of someone who gets infected. As stated previously, this episode of Supernatural follows the superhero hit film Chronicle, only switching out superhero powers with monster abilities. Unfortunately, because it does replicate many plot points from the movie, audiences many find themselves one step ahead of many twists and turns that this episode contains. Though Supernatural has done parody episodes in the past, the almost non-existent inclusion of the Winchesters turns this episode into something other than typical Supernatural fanfare. And without the humor of past episodes such as "Ghostfacers," some may be hoping for the return of the quest for the Word of God. Here's a quick breakdown of the episode: Brian and Michael are friends; Brian and Michael find Kate, a beautiful woman; Kate and Michael begin dating; Brian secretly loves Kate; Michael gets bitten by a monster, begins to gain abilities; Brian wants Michael's powers; Brian tracks down the prime monster, forcing him to turn him; powers get out of control and a battle ensues, leaving most dead. Throw in a couple of appearances by the Winchester brothers and that's the episode in a nutshell. This week's episode, although jarring, was an entertaining enough story in its own right. However, because much of the season has been awkwardly focused, such sidesteps might deter audiences from anticipating the return of the actual story. No matter how entertaining the episode may be, audiences have to remember that nothing actually occurred to advance the overall plot of the season – of any the Winchesters' plots, for that matter. What may have been a welcomed breather in past seasons feels like a poorly-planned fourth episode in a scrutinized season. Fortunately for those who wish to continue to put their faith in the Supernatural collective, November sweeps will bring the highly-anticipated return of some familiar characters, meaning that things could soon return to their (hopeful) former glory. If, however, your fanaticism is waning, you've got to at least admit that producers have proven they're capable of presenting a compelling character story. Now if only they'd focus it on Sam and Dean.